Pastor Daniel talks with his friend and fellow pastor, Pilgrim Benham, Shoreline Church, Bradenton, FL, about leadership development pipeline. What is it? Using lots of sports analogies, these pastors discuss the process of leadership development by having a long-term plan of how to disciple leaders through every stage, no matter the starting point. Why is a process of leadership development so important for the church? What if we don’t have one? The point is, people need guidance, they need vision. They need encouragement and a plan. As a shepherd/leader, we are called to know the condition of our flocks. And then to equip them for the work of the ministry so they can equip others. For an in-depth look at this topic, check out Pilgrim’s new book, Five Ships. Daniel Fusco, Lead Pastor at Crossroads Church, with campuses in Vancouver, WA and Portland, OR, shares his one piece of advice about how to overcome obstacles. Don’t be surprised at obstacles—expect them. The incomparable value of being conformed to the image of Christ through obstacles is evident. What is your plan for dealing with obstacles? You expect, you plan, you overcome. Pastor Pilgrim Benham, Bradenton, Florida, shares about persevering in the hard work of ministry, challenging us to reset our minds and have a different perspective about work, remembering what it is we are called to do. The great story of Ernest Shackleton’s exploration of the Antarctic and how those who went on that expedition knew what they signed up for is worth hearing. The Apostle Paul writes about what he suffered in the hard work of ministry in 2 Corinthians 11, that he was imprisoned, beaten repeatedly, near death, shipwrecked, tortured, stoned, constantly in danger and suffering from a chronic physical ailment. What kept him going? Jesus did. But He said to me, “My grace is sufficient for you, for my power is made perfect in weakness.” (Hebrews 12:9) What is overwhelming you in ministry? Call out to Jesus. Paul also wrote about running this race with endurance—which is very hard work. Endurance is “patience where you sit down and accept the thing that is in front of you. And not just sit down, but master it.” Are you not bearing fruit like you thought you would? Don’t look back. Brothers, I do not consider that I have made it my own. But one thing I do: forgetting what lies behind and straining forward to what lies ahead, I press on toward the goal for the prize of the upward call of God in Christ Jesus.” Philippians 3:13-14 Ministry is hard work. But stay focused on Jesus and finish well. He is worth it. 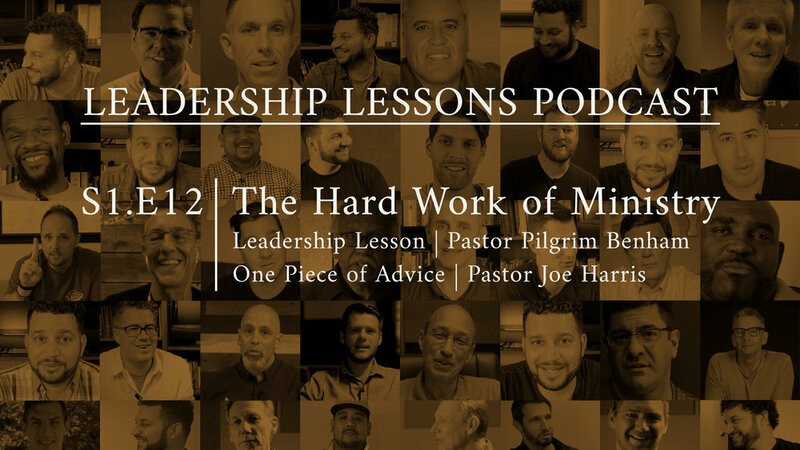 In this week’s One Piece of Advice, Pastor Joe Harris, Tampa, Florida shares his advice about working hard.